A family man is faced with the unthinkable in this nerve-shredding psychological drama. The Greek myth of Iphigenia is given the Yorgian treatment. Lanthimos continues to astonish with his blend of tragi-comic strangeness. The trademark mundanity, monotone dialogue and awkwardness displayed brilliantly in The Lobster returns but this time there’s real darkness lurking. It hides behind every conversation, every encounter. And when finally unmasked to the cold light of day, it floods the brain like a red mist. This mythical tale of cold-blooded revenge is agonising at times but it’s a work so radical and unsettling that it demands attention. A Greek tragedy sent roaring into the 21st century kicking and screaming. It’s about as suffocating and strenuous as they come with an otherworldly vibe that paralyses with dread. 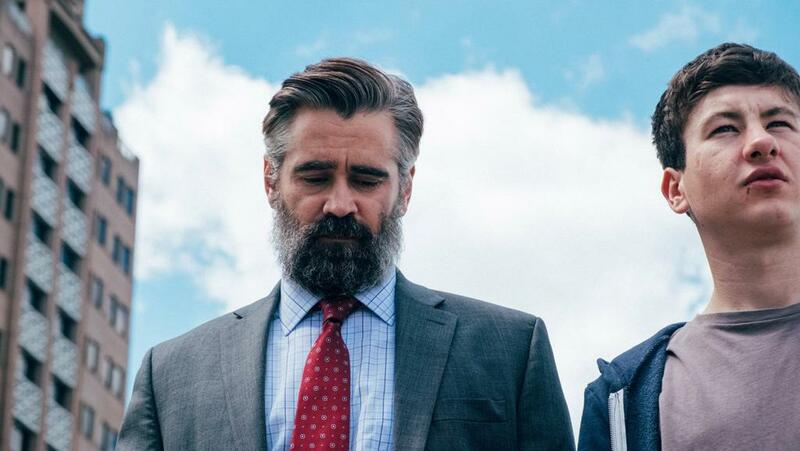 Colin Farrell plays Dr.Steven Murphy and continues his fine form from The Lobster. He plays an uber successful, wealthy heart surgeon with a seemingly happy life who lives with his wife, Anna (the icy Nicole Kidman), daughter Kim and youngest son Bob. But just why is he continually meeting with a teenage boy, Martin (played brilliantly by Barry Keoghan)? The relationship is shrouded in mystery. A boy who’s he’s taken under his wing? Or is there more history beneath the exterior? In typically theatrical fashion, they meet and exchange gifts but it feels awkward with a sense all is not quite right. The watch-strap metaphor continually discussed eludes to a ticking time bomb ready to explode at a moment’s notice. Martin casually integrates with the family and develops a special relationship with Kim, while Steven meets Martin’s needy mum who is desperate for his affection. From what began as a light-hearted tone gradually shifts gears to become somewhat sinister as it’s revealed Martin’s father had died at the operating table. When son Bob and then daughter Kim are taken to the hospital with a mystery illness, the shift in tonality is palpable. It’s a paralysis of the limbs that renders the children bedridden and virtually comatose. There’s vibes of Apichatpong Weerasethakul’s spiritual Thai drama Cemetery of Splendour. With the doctor’s performing countless tests, it’s clear there’s no logical diagnosis. When Martin appears at the hospital, the jaw-dropping revelation is steeped in mythological lore. The feeling that an omnipotent force is exercising some form of ‘justice’ becomes abundantly clear. This eeriness clashes with the clinical nature of Steven’s profession. It’s an irony that is not lost and is hammered home. When Steven is given a way out of the madness, it thrusts him into a choice of unthinkable consequences. The descent into horror is staggering and unrelenting. And there’s no shying away from its bleakness. Thimios Bakatakis’ voyeuristic camera is a character in itself and gives the foreboding sense that someone or something is watching. 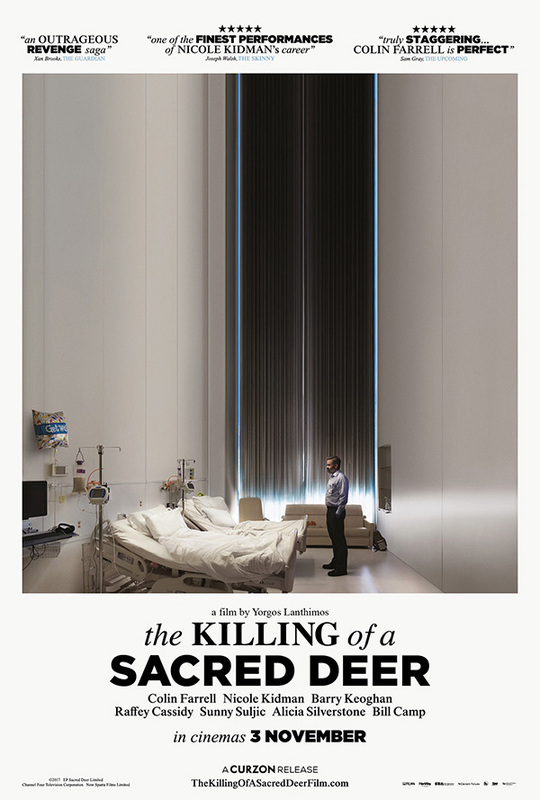 A claustrophobic omnipresence that gives The Killing of a Sacred Deer a highly anxious edge when married with the operatic soundtrack. This one haunted me for weeks on end and I still can’t quite shake its legacy.